Bay 1: Eighteen 16" long x 8" diametre polypropylene filter brushes - They are of a semi-rigid construction with a wire loop at the end for easy cleaning. Bay 2: Blue matting - This is an excellent filter media as it has a large surface area giving it an excellent bio-mass retention. Its open texture removes larger particles from the water. Bay 3: Three layers of reticulated foam with different density of porosity of each layer. This is on top of a layer of approximately 2 cubic foot of flocor. Bay 4: Six way foam block manifold assembly on top of six cubic foot of Flocor. The large surface area of Flocor tubes makes it an ideal filter media. FREE P&P ENGLAND ONLY (excluding Cornwall) - other areas please call for quotation. 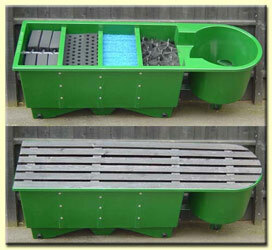 Manufacturers and Wholesale Suppliers of Pond Equipment.